To see more of the beauty of the Little River, come upstream Saturday and paddle in the Sixth Annual BIG Little River Paddle Race! Thanks to Bobby McKenzie for holding down the Troupville cleanup single-handedly while all WWALS board members were otherwise occupied; Bobby also brought some personnel from Moody Air Force Base. Thanks to Aaron Strickland and Keep Lowndes-Valdosta Beautiful for sending the scouts and arranging for trash pickup later. Thanks to all the organizations listed as sponsors on the signs WWALS Outings Committee Chair Phil Hubbard planted at Troupville Boat Ramp the previous day. Maybe other organizations would like to become associated with such cleanups to improve the health of our waterways and drinking water and for recreation for children and adults, by sponsoring the Withlacoochee and Little River Water Trail, like the organizations with logos already on those signs. 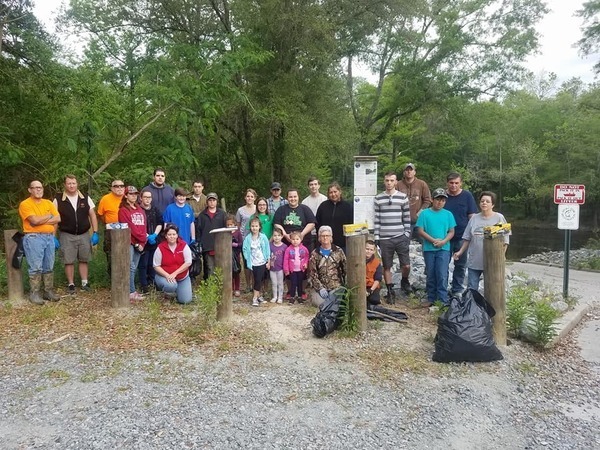 Or maybe some of you would like to join the WWALS Outings Committee that scheduled this cleanup, or the WWALS Trails Committee that designed those signs. My count on the site was about 35 of the 30 Gal trash bags, 5 tires, a bumper from a Pontiac Bonneville and a life size motorcycle sign as the big ticket items and of course if VLPRA comes and oulls the boat out… there is that…The KLVB rep said they coordinated VLPRA to come get the boat. About WWALS: Founded in June 2012, WWALS Watershed Coalition, Inc. (WWALS) advocates for conservation and stewardship of the Withlacoochee, Willacoochee, Alapaha, Little, and Suwannee River watersheds in south Georgia and north Florida through education, awareness, environmental monitoring, and citizen activities. Since December 2016, John S. Quarterman is the Suwannee Riverkeeper®, which is a staff position and a project of WWALS as the Member of Waterkeeper® Alliance for the Suwannee River Basin. For more WWALS outings and events as they are posted, see the WWALS calendar or the WWALS outings and events web page. WWALS members also get an upcoming list in the Tannin Times newsletter.